In an interview with The Wall Street Journal, Apple design chief Jony Ive revealed the company reached out to Hermes over a potential Apple Watch partnership before the device was unveiled last year, a project ultimately undertaken by the French luxury brand's artistic director Pierre-Alexis Dumas. While the Hermes Apple Watch was announced at Wednesday's massive "Hey Siri" event, both companies agreed to collaborate on the special edition last October before Apple publicly unveiled its first wearable, The Journal reports. Discussing new platforms with outside parties ahead of a formal launch is a rare move for Apple. "It's something highly unusual for Apple to do —to talk about an unannounced project," Ive said. Perhaps more unusual, however, is that Apple is essentially allowing Hermes to appropriate Watch branding by emblazoning the firm's trademark on custom watch faces and silver strap buckles specific to the special edition. For the Hermes Apple Watch, Apple digitized three fonts Hermes normally uses on its own mechanical watch lineup. "I've been at Apple 23 years and this is conspicuous and singular. I've never known anything like this," Ive said. When it launched, Apple Watch was unique in that it was a device conspicuously devoid of visible Apple branding, even digital watch faces lack the familiar fruity logo (unless users add one in manually). It can be argued that Watch's design is an instantly recognizable, and is therefore a type of branding in itself. For Hermes, a partnership of any kind is uncommon, though the company has an interest in staying relevant in today's tech-driven consumer market. And Apple is arguably one of the best at identifying trends and steering sentiment. Detailing the Hermes edition Watch, Dumas highlighted the five distinctive color choices available to buyers. Ive and Dumas knew of each other's work prior to partnering, but Dumas singled out the bold the translucent iMac G3 with its bold colors as particularly intriguing. 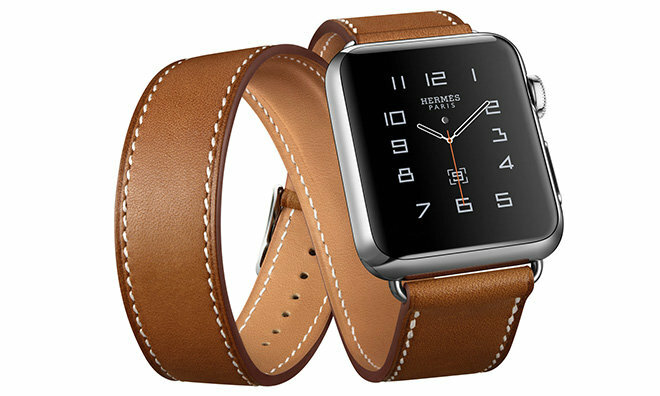 The Hermes Apple Watch will go on sale at Apple and Hermes stores on Oct. 5, with prices ranging from $1,100 to $1,500. Three different leather band styles —double tour, single tour and cuff —will be available in both 38mm and 42mm Watch sizes.